Top 3 Restaraunts in the West End, Roatan 2013 | We LOVE Roatan Blog!! West End Roatán is know for its restaurants and bars. The sleepy little town lights up at night ready for all the locals, tourists and divers to come out and enjoy the night. 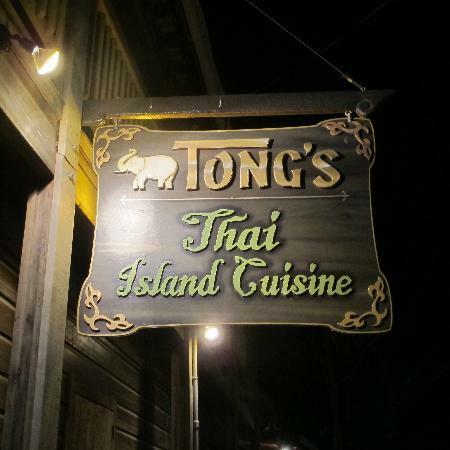 The best restaurant in West End is Tong’s Thai Island Cuisine. It’s located in the middle of West End on a pier over looking the water. The menus is fantastic and authentic. They serve everything from Thai curries to Pad Thai’s to Cashew Chicken. If you’re not up for a full meal try one of their appetizers and mixed drinks, the mojito is my favorite! And for desert, deep fried bananas and ice cream. Perfection! Next up on the list is Blue Channel, an authentic Italian pizza place in Roatán! Thin crust pizza with mouth watering topping. They also serve great wines! On Friday nights they have a band that starts at 8 pm. Dinner, drinks and entertainment! Last but not least, The Argentinian Grill is located on the east side of West End. A little out of the way for most dinners but its well worth the efforts. Located on Half Moon Bay just 2 mins from Sundowners Beach Bar. The Argentinian Grill specializes in steak and seafood. They have an extensive wine list and their deserts are to die for.